I surrender, but the “white flag” does not mean I’ve given up. Last night when I painted, I felt very frustrated with having the camera on me. So far, I’ve been trying to angle the camera, and myself, in such a way that hopefully the viewer could see what I was painting. It is an ergonomic nightmare. My neck, back, arms all end up sore after a few hours of painting that way. And still, it has been increasingly difficult to keep myself out of the shot. Beyond vanity, my concern is that I am at a point in the painting that I need to spend some time very close to the canvas, as I add detail. Which means if I ignore the camera, there may be long periods of just my back. At the same time, I am also at the point where I need to be constantly backing up to look at the painting as a whole, then going in to make adjustments to value etc. 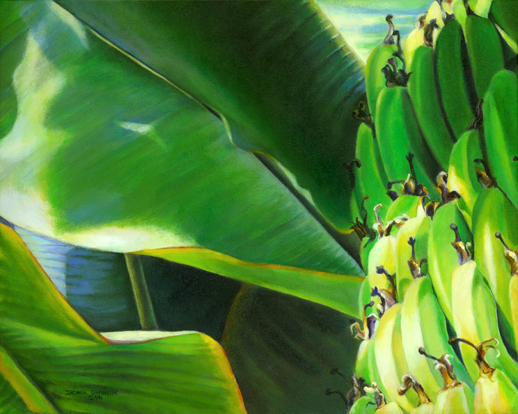 The way I paint is not efficient, I would not teach someone to paint this way. When I have a colour on my brush, I use it up, wherever I can on the canvas, before cleaning the brush and changing colour. Call me cheap. And maybe also impatient. I’ve never been the kind of artist that uses small brushes and starts in one corner of the canvas working a little section until is is complete, and moving on until the whole canvas is done. Sure, it would make for an awesome timelapse video. But that is very much against my personality. My method is more a frenzy of colour, followed by hours and hours of small adjustments, pushing and pulling until I’ve hopefully tidied up the embarrassing bits. Re-reading that, I have to laugh at myself. Why do I feel compelled to write this stuff, and even crazier, share it with the …. umm … millions who read my blog? And I compare the tone of my writing, to a male artist friend who tags his art on instagram #acrylicgenius #artinovator. Ah, to be a male artist. Anyway, getting back to my frustration. My studio space is crowded right now, and having the camera on a tripod directly behind me is literally cramping my style. So these are the excuses I’m offering up to explain the white flag. The video below might illustrate my confusion, I was adding in detail, but I wasn’t close enough to get what I wanted, and kept getting the stroke, or the colour wrong. So I went to bed. Twenty four hours later I’m writing this blog post, to say this might be the last time-lapse this month. Unlucky #13. It is Valentine’s day – or it was when I started writing this – and I was reminded that self-love, self-care is a very important part of finding balance in everyday life. The 30 in 30 challenge was necessary, a defibrillator for my artistic practice. 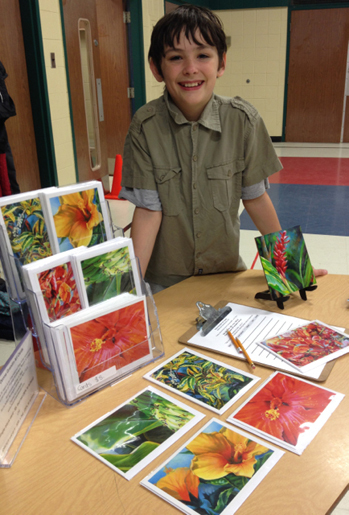 I was spending more and more time on volunteer activities, and less and less on creating art, and on my business. The first couple of days were hard because I had to miss certain events so that I could paint, blog etc. But from the first day, my painting mojo was back. And a week and a half into it, my priorities had already shifted. I didn’t really mind the other things that were falling away/behind while I focused on the 30 in 30. In the last few days though, I’ve realized that the pendulum has swung to the other extreme. Now I’m failing in other areas of my life. Not sleeping enough, reverting back to bad eating habits. Not getting exercise. Not connecting with family & friends, trying to help the kids with homework and paint/blog at the same time. Even my to do list for the volunteer work, & my actual business, were stagnating. And we’re not even going to talk about the housework. So this is how I spent Valentine’s Day – I hoisted my white flag. Then I napped for 3 hours once the kids were off to school -I’d only slept for 3-4 hours before waking them up. I tidied up a bit, caught up on a bit of computer work & errands, went to my first yoga class in a long, long time. Exchanged gifts with hubby. Helped my youngest study for a science test, wrote this blog. I have a bunch more things to take care of, so I may not end up painting tomorrow either. But I will reorganize the studio a bit to make more space for me to move about when working on this bigger (4’wide) painting. We have a 4 day weekend coming up, and it would be easy to sit at my easel, and computer each day. But then the Mom guilt would kick in. Experience tells me that 50% of the rest of my family would then spend the whole time on their electronics. My youngest would spend 50 % of his time on x-box gaming with his school friends who are at their houses, and 50% in my studio asking what he can eat next, and reading his dream journal to me, showing me the latest video he’s made using his artwork, or skits he’s acted out, & new cool apps etc. etc. And I’ll have to wear my headphones because he’ll be watching Good Mythical Morning, or Nerdy Nummies without headphones while he’s making video game characters out of polymer clay. Yeah, I love it. But come Monday night when the eldest wants to stay up crazy hours to complete homework, I’ll also be regretting not pushing to get us all out of the house, socializing, being active. When I started the 30 in 30 I was not trying to create a painting every day, or to sell more paintings, or become a daily painter. I just wanted to re-activate my painting mojo, and build some momentum as I start a new series of paintings. And to try making time-lapse videos. I feel that that ball is back in the air now. And the real goal is balance. The 30 in 30 is a great accountability tool, but you have to make it work for you. It is important to know when to shift, adjust, pivot, to wave the white flag etc. So, I’m going to follow my intuition, but I’m not going to make any promises about when next I’m going to post, what I might post etc. I will say that “Journey to Self” is a self-portrait, even though I am not the figure in it. It is the starting point of a body of work which for now, I will call FLOW. And turning the camera off will give me the freedom I need to explore and develop this work. Subscribe to Blue Roots Art Studio News if you want to get glimpses of my new art, shows, and creative insights etc. 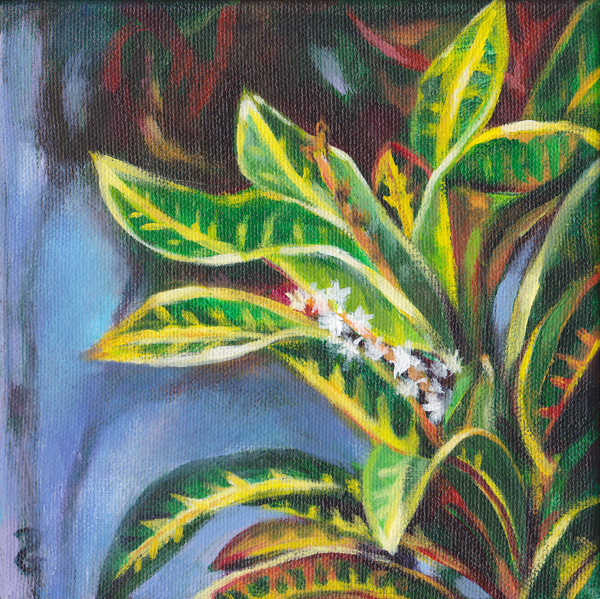 Croton flowers, 6″x6″, acrylic on canvas, ©2016 Donna Grandin. $100. 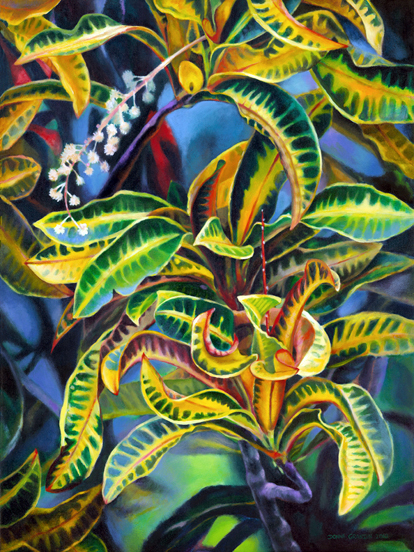 This little croton beauty was my last painting of 2015. I was considering doing the 30 paintings in 30 days challenge for January, but this painting helped me to decide against it. Doing a painting every day means you have to work fast – which is a good exercise for so many reasons – but at this time I just couldn’t get myself to jump on that hamster wheel. For 2016, I want to take better care of myself. That means getting more sleep, eating better, exercising more etc. It means not stressing myself out unnecessarily. Having more time to spend with my family, and friends. 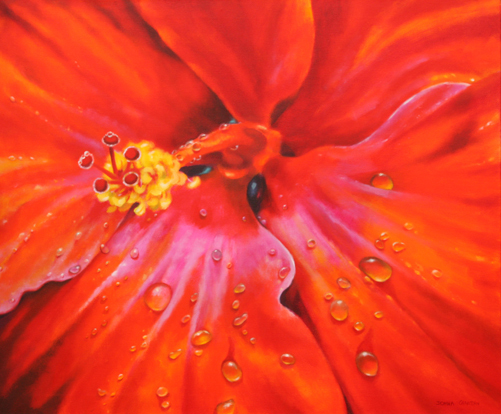 This painting holds a special meaning for me – similar to the adage “stop and smell the roses”. 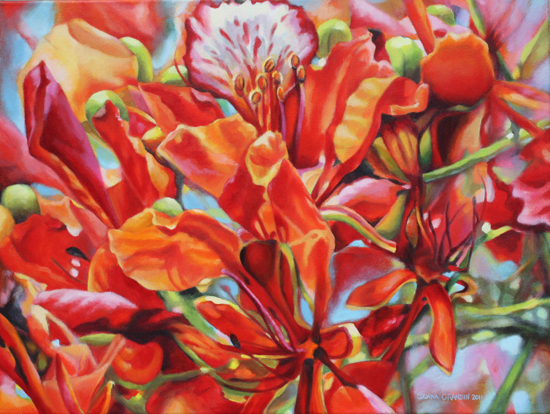 It reminds me of a larger croton painting I did a few years ago, “Exuberance”. I spent almost 2 months on that painting – the longest I have ever spent on one image. The longer I painted, the closer I looked at my reference photos, and the more details I added to the painting. Then one day I realized something. I realized that in the midst of all of the colourful leaves, there was the occasional stem covered in tiny white flowers, like little starbursts. I had seen the stems with the buds before, but for some reason I never noticed the flowers. 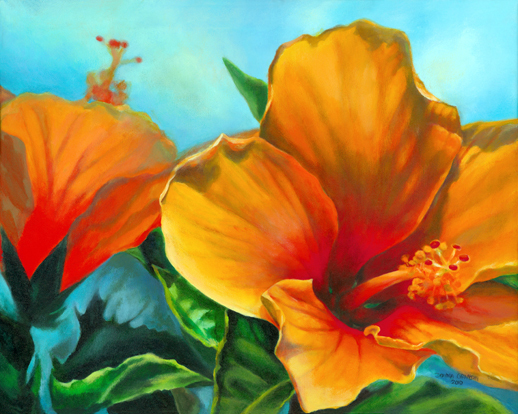 Growing up in the Caribbean, there were croton bushes of all sorts surrounding us. Striking, and yet common place. But it was only when I slowed down, I could really see what was in front of me the whole time. That is what I want for 2016. To be able to slow down, and appreciate the beauty already in my life. How about you, what are your hopes for the new year? Torch Gingers, 6″x6″, acrylic on canvas, © 2014 Donna Grandin. SOLD. I would be lying if I said that I didn’t struggle with my painting yesterday. I made several false starts, changing subject matter etc., but finally – around midnight, back in the comfort of my own studio – I made a good choice, and everything else flowed. I am glad I pushed through, just kept painting until I made it to the other side, because I am very happy with how this little painting turned out. On the other hand, I have reached a point where pushing to post a new painting (that I am proud of) every day has less benefits, and will be detrimental to my larger goals this week. So, I will be pausing my painting to catch up the business side of my art career, to prepare for my Culture Days event on Friday, to attend to family and household matters … and to catch up on sleep! Instead, I will re-share links with paintings – that I created earlier in the year – onto Leslie Saeta’s blog for a few days. And when it feels right, I will paint and post new paintings for the challenge. I am not quitting altogether, I am just side-stepping the self-imposed craziness. As an entrepreneur it is easy to get caught up in the drive to move forward and to forgo/forget about self-care, but it is important for avoiding burn-out. Good luck to all of you artists who have taken up Leslie’s challenge this month, and thank you to those of you who are following me, and commenting on my blog! 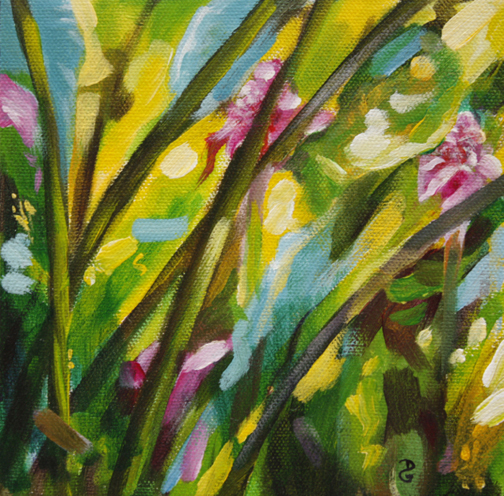 Torch Ginger Trio 3, 6″x6″, acrylic on canvas, © 2014 Donna Grandin. $100. Here is the third canvas in the Torch Ginger Trio. As I mentioned before, the paintings can be hung/purchased individually or as a group. 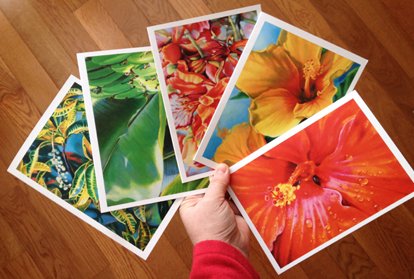 They are inspired by my recent trip to the Caribbean, where exotic flowers & foliage abound! I enjoyed painting these in a very loose, flowing style, I’m looking forward to doing it on a larger scale, where I stand & use my whole body – painting from the shoulder, instead of the wrist. Meanwhile, with the painting I will post tomorrow, I went in the opposite direction. 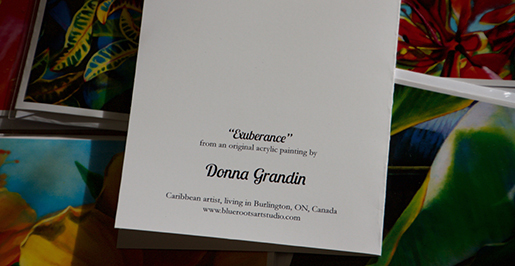 Subscribe for blog updates so that you don’t miss any new paintings, exhibition announcements etc.! And if you’re in the Burlington area, I will be offering art classes from October. Thanks for the great feedback everyone, I’m happy to hear how many of you are excited that I’m doing the 30 paintings in 30 days challenge again. Thanks for following along, and please share with your friends! 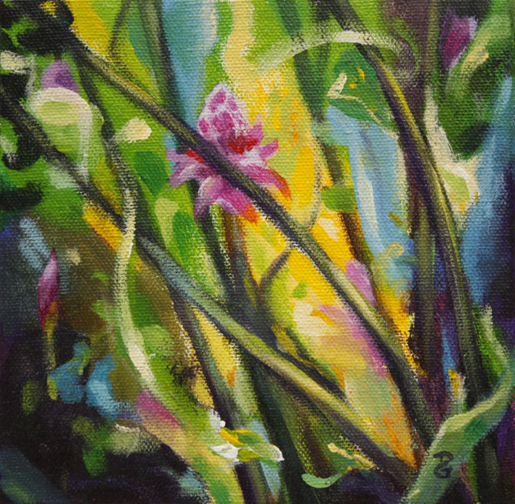 Torch Ginger Trio 1, 6″x6″, acrylic on canvas, © 2014 Donna Grandin. $100. Yes. I am that crazy. They say if you need something done, give it to a busy person to do … and I know that to be true. So, at a time when I am completely overwhelmed by how much I have on my plate, I’ve signed up to do Leslie Saeta’s 30 paintings in 30 days challenge again this year – along with over 800 other artists from all over the world. Admittedly, it is a form of escapism. Self-medicating with art therapy, meditation, however you think of it, there is something about the act of painting that centers a person. It forces you to be in the moment, and the more you give in to your instincts, trust your intuition, the easier the work flows out of you. And you are changed by the process. Art is my mood-altering drug of choice. After a fantastic 5 week working vacation to the Caribbean, my return home has not been an easy transition. It felt as if a giant baby picked up my house, shook it like a rattle & then put it back down. It seemed everything was in the wrong place, and it’s taken me almost 2 weeks to get a handle on it. Some of this is our own doing – a make-over for my son’s bedroom – and some of it is due to a freak flood that happened in our area (2 months worth of rain in 3hrs), which seeped into our basement. We have to replace the flooring, and I’ve had to empty my office/storage room and slowly but surely I’m purging through paperwork etc. that has accumulated over the years. Two of the items I unearthed were a calender from 1993 – the year I started University – and a vinyl sign (Aquavisions by Donna Gomez) from my first solo exhibition in 1996. It will take time to go through, there is a large portfolio of older drawings that got partially wet & has some mildew. I’d like to photograph the drawings before getting rid of them, and each one is charged with nostalgia. I am considering turning this into a little art project. As I look forward to other things coming up this month, I realize it would be easy for the weeks & months to zip by before I get back to a more consistent painting routine. So, instead of waiting till the chaos is over, I’m going to accept this as the new normal. And I’m going to balance the chaos with creativity. 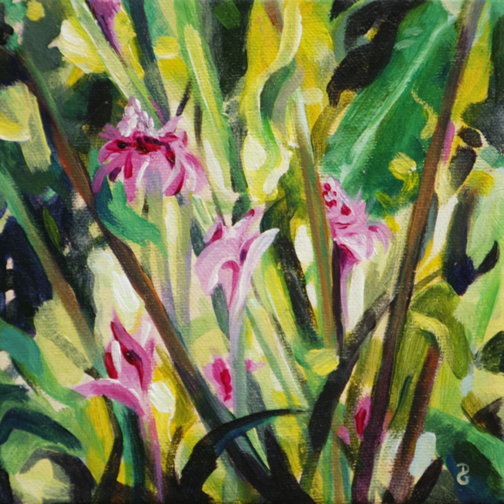 This painting of torch ginger lilies is one of a trio of small paintings I just completed. They may be purchased individually or as a group. I will post one a day, I just wanted to get a couple days ahead of the challenge so that there isn’t too much pressure to produce. And this may be the longest blog post for some time, most days I will probably just post the image & details. 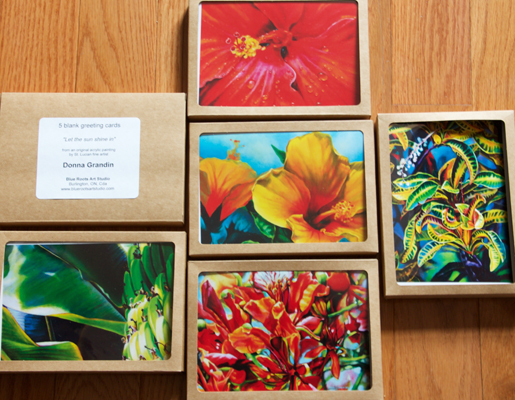 Sign up to receive blog updates by e-mail & you’ll get the first look at available paintings!